The Enterpreneur of the Year Awards is here again to appreciate the best businessmen and their unique approach to enterpeneurship. A respect to a socially responsible enterpreneurship is specially important to Chivas Regal as well, the brand that went all out to partner up with this prestigious competition this year, too. It is going to be organized for the 12th time in a row in September 2017 under the auspices of the President of the Slovak Republic, Andrej Kiska. The Enterpreneur of the Year in Slovakia Awards is organized in an effort to appreciate the best enterpeneurs, the ones who conduct honest and responsible business without being overly selfish. The idea of socially responsible enterpreneurship is not what the partner of the awards Chivas Regal considers a one-time thing, either. As early as the beginning of the 19th century in Aberdeen, Scotland, the founders of the brand, the Chivas brothers, James and John figured out pretty fast that the money form their successful business can be put to better use helping the less fortunate and the needy, in other words, where it makes all the difference. So with their piecemeal contribution they helped make the world a better place. And that’s exactly the very source, the claim of the brand “Win the right way” comes from. It definitely serves as motivation for everyone to live life to the fullest while winning the right way. So that’s why Chivas Regal has become the partner of the prestigious competition that awards people with a similar mindset. The winner of the Enterpreneur of the Year is to be determined by a jury taking into account not only the financial results of the given business, but the enterprenurial spirit, the personality aspect, the approach to innovation and the nation-wide and global impact as well. In other words, pretty much everything that the tagline “Win the right way” implies. “We have been producing a highly valued and globally awarded whisky for more than two centuries and have been living by the message of our founders. A lot of people consider a toast with a Chivas Regal a way to celebrate enterpeneurial success and we go all out to highly appreciate all businessmen who succeeds by the adage “Win the Right Way”. The renewed partnership with the Enterpreneur of the Year Awards is intended to emphasize the fact that there is more to the philosophy based on business success – however it only applies if there is absolutely no doubt as to the cleanliness of the nature of methods the success was achieved with,” as Matúš Kollár the Brand Manager at Pernod Ricard Slovakia being the official distributor of the brand on the Slovak market, put in his two cents. The Enterpreneur of the Year Awards dates as far back as 1986, the year when the very first awards was organized by the company EY in the USA. And it has stayed the measure of business success ever since. The winners of the regional rounds taking place in 60 countries globally, gather every year for the global finale in Monte Carlo. The EY Global eterpreneur of the year this year has become a Canadian enterpreneur Murad Al-Katib from AGT Food and Ingredients Inc. The EY enterpreneur of the year in Slovakia in 2016 has become Jozef Klein and the company Asseco Central Europe, a.s. The EY enterpreneur of technology in 2016 has become Ján Lunter, the co-founder of Innovatrics s.r.o. The awards is being organized for the 12th time in Slovakia in September 2017 under the auspices of the president of the Slovak Republic Andrej Kiska. Chivas Regal is a proud partner for the second time in a row. „The EY Enterpreneur of the Year has been a living proof that not even Slovakia lacks enterpreneurs who are willing to go the extra mile to make their country a better place. 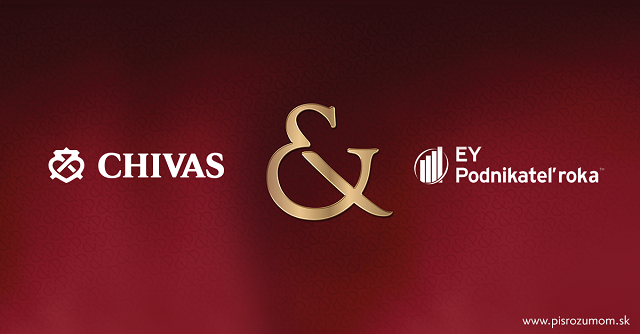 We are more than happy to cooperate with Chivas Regal among others which highly values these qualities, just like we do,” Matej Bošňák, the leading partner of EY in Slovakia added.